The LCD screen displays each denomination total and grand total. Special Blow Out Pricing! Limited Time Only! Marked down from $779! 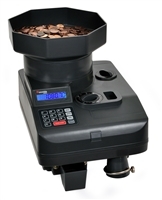 Check Signers, Currency & Coin Counters, Coin Scales, Coin Sorters, Coin Crimpers, Bill Strappers and More! Money handling equipment is now available at the lowest prices - guaranteed. Factory Express offers a wide range of bank grade money handling equipment suitable for the banking and casino/gaming industry, as well as machines suitable for the home or office. Check signers, currency or coin counters, and coin scales are offered with manufacturers like Royal Sovereign, Cassida, Klopp International, Ribao, among others. Count, sort, weigh or wrap money quickly and efficiently with a quality machine from Factory Express.